Continuing along the same lines of the best waterproof jackets, this time we will be reviewing a men’s jacket by Jack & Jones. A short introduction on the brand, it was established in 1990, when their men’s collection excels at Oslo’s fashion fair at the time. The brand, then, proceeds to become one of the most popular jeans brands in the following years, whereas today, they have several hundred stores in 38 countries. They manufacture outdoor clothing, including footwear, sweatshirts, T-shirts and several others. One of their most popular line of designs are their winter jackets, whose quality and trendy styles make these jackets a must-have, for anyone looking to purchase an item that will last for years. 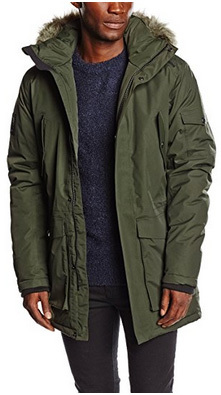 As for the jacket that we have selected today, it is the Meyland Tech, a waterproof and versatile winter parka. This is a previously featured parka in our jacket collections, but you will see as to why it deserves its very own review. * Note: The availability of the jackets (including colors and sizes) might change in time. Also please check the jackets’ materials on the various shops before buying. We do our best to assure the accuracy of our articles, but sometimes they might contain errors. Meyland is a parka, and as such, it is intended to be worn as a daily jacket, or as a heavy winter jacket for those who spend long hours outside. Parkas make the best winter jackets, however they are not very fitting for those practicing sports or looking for a jacket that they can go jogging in. However, Meyland, unlike most parkas, has ergonomically designed sleeves, which allow not just for comfort but also functionality, so if you enjoy hiking, trekking and camping during the colder months, look no further. This parka comes with just one minimalistic logo on the right sleeve and without extravagant color combinations, which is a plus if you are looking for a jacket that you can wear at work. It will go nicely with the uniform or any outfit, actually, and will make you look professional and well-dressed. The style and look of this jacket, make it neutral when it comes to which outfits it suits best. It goes quite well with either formal or casual outfits. We will be offering suggestions as to which color options are more suitable for each occasion, in the color selection paragraph. It comes with two oversized flap pockets on the sides, with enough space for your essentials and hands, too. On the chest, there are two flap pockets, as well, and one flap pocket on the left upper sleeve. There are inner pockets, too, one of which has an earphone duct, so you can listen to music or radio when outside, without running the risk of damaging your MP3 player or phone by rain and snow. The outer cuffs are standard and they fit tightly around the inner cuffs, which are made of ribbed, elastic material, adding to the insulation, as well as protecting the wrists. The main zipper is waterproof and covered by a snap-button placket, which goes all the way up to the stand-up collar. On the collar, which is high, there is a detachable hood, adjustable with drawstrings on the back, and is lined with faux fur trim, also detachable. Fur trims, in parka jackets, are not just a fashion choice, they can prove quite necessary for those who live in windy areas, as it protects the face against cold drafts. Another thing that is surprising about this jacket, is that despite being super warm and insulated, it is lightweight and not chunky, making movement easier and the whole jacket a lot more comfortable. And if you were wondering about the fit, it is a normal fit and can be adjusted by drawstrings inside the hem and waist. This jacket is made of two different materials on the outside and inside, so we will take a look at them separately. 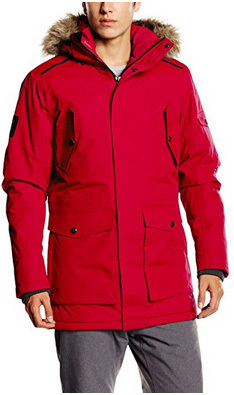 Starting with the outer shell, it is made of 100% Nylon, with a water column of 8.000mm, making the jacket waterproof. It is also windproof, meaning that cold drafts or even rain and snow, during windy days, will not be able to get through. This is also guaranteed by the waterproof zipper and its covering placket, along with the drawstrings around the hem and elastic cuffs. The inner layer is made of 100% Polyester, which is highly breathable and insulating. Apart from that, polyester is also well known for its ability to provide warmth, which is essential when it comes to winter jackets. 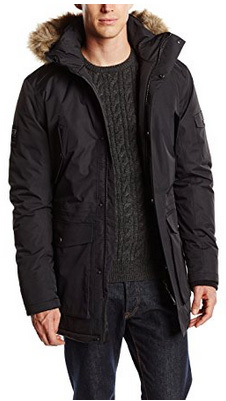 However, the job to provide and maintain warmth in this parka is not left solely to its polyester inner lining, but to the padding as well: it comes with Thinsulate TM insulation, by 3M. This is a synthetic fiber, which does an incredible job at thermally insulating the jacket. These fibers are much smaller than typical polyester fibers, which are used for insulation and they perform much better due to their increased density but decreased size. When compared to down filling, they have a slight disadvantage when it comes to providing warmth, but if the jacket gets wet, this synthetic insulation still manages to provide warmth, which is not something that down feathers are capable of. These fibers also have small gaps in-between, in order to allow moisture to escape, therefore preventing overheating. And since we mentioned overheating, we did mention earlier about this jacket’s high breathability and its insulation layer, along with the polyester lining, do a really good job at preventing that. This is especially important because, when you tend to layer clothing underneath winter jackets, and then move around with the jacket on, the warmth produced by the body can sometimes be excessive, which, without a proper breathable material on the jacket, can make things go downhill quite fast. The faux fur trim is made to resemble real fur in both looks and performance, which makes this jacket a great option for those who do not prefer real animal fur on their clothes. The Meyland parka comes in four color options, three more classic colors and the Red option for those who prefer a more daring look and enjoy some color in their style. All of them are suitable for casual clothing, but as we promised, there will be suggestions as to which of the colors go best in other occasions as well. You can certainly select according to your preference and style, of course. The Black option is the classic jacket color and it suits formal clothing, apart from casual ones. Since we mentioned how this jacket can be worn to work as well, this color would be the best choice. Asphalt is a light grey color, that goes well with grey suits and also work clothes. It suits both jeans and suit pants, and of course sports trousers, too. This could also be a good selection to wear to work, too. Jester Red is the most “out there” option. A beautiful color, that will kick any outfit up a notch. And lastly, Forest Night, a dark green color, that looks fantastic with casual outfits, but wouldn’t fare too bad with formal clothing, either. Well, we are at certainly the most important paragraph in our review, where we will be taking a look at what those who have purchased online and worn this jacket think, and what their experience has been like. Because we are attracted to what we see first, many reviewers comment on the way this jacket looks and especially its quality. It certainly looks good in the pictures, but in person it is even better. The colors are beautiful and the whole look it gives to different outfits is one of its best features. You can look elegant and well-dressed without having to purchase expensive clothing or put too much effort and time into outfit planning. A good deal of them have received quite a few compliments on their choice. As for being waterproof, it definitely is. It has been tried and tested in both wind and snow, all the while keeping the wearer dry and comfortable. 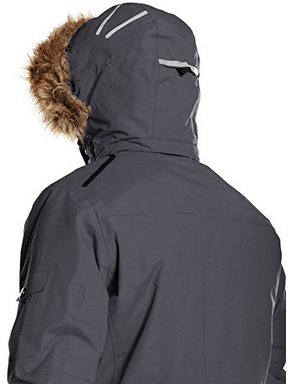 Its wind resistance has also lived up to the expectations, especially the hood and faux fur trim, which do a really good job at protecting the face. What we didn’t mention earlier, because it’s something that online reviewers have come across too, so we wanted to feature an unbiased opinion, is the jacket’s durability and resistance to environmental conditions. This resistance is not just referring to the longevity of this parka, but to its actual wear and tear resistance, which, for those who are avid hikers or enjoy camping, is quite important. And lastly, is this jacket as warm as it claims? Definitely. Each of the reviews we’ve read attests to that, as those who have tried it on, even in freezing temperatures, were warm and cozy the entire time. 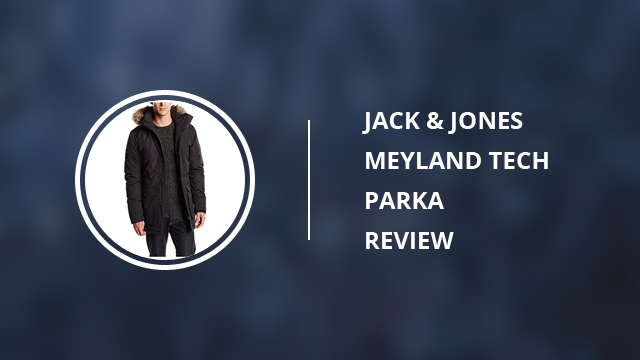 As you saw, there was plenty to be said about the Meyland Tech parka by Jack & Jones, not just by us, but those who have purchased it, too. 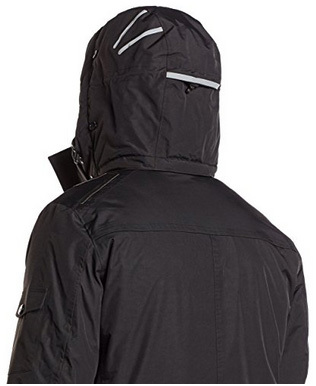 To conclude this review, this is a fully waterproof parka, with windproof fabric and hood, suitable for those who live in cold conditions where rain and wind are a common thing. It looks great, feels great and will last for many winter seasons, so we think it is a reliable jacket and a reliable purchase, certainly deserving of its popularity and good reviews. coat is waterproof and windproof for sure.. BUT! You can feel comfortable just max up to -5 degree of celsius in this coat… It is really pitty that jack jones sellers claim that it is their best choise for winter! Now is -10 in my country and I am very dissapointed that it is super cold in this coat.. Thanks for your honest review Jerzy!